Looking for some good snacks that are easy and tasty enough for lunch boxes or after school, yet classy enough when you have grown-up company? Cheese and crackers or chips and salsa are a go-to for most, but this super simple homemade version of crostini will make you think twice before picking up those basic crackers at the store! 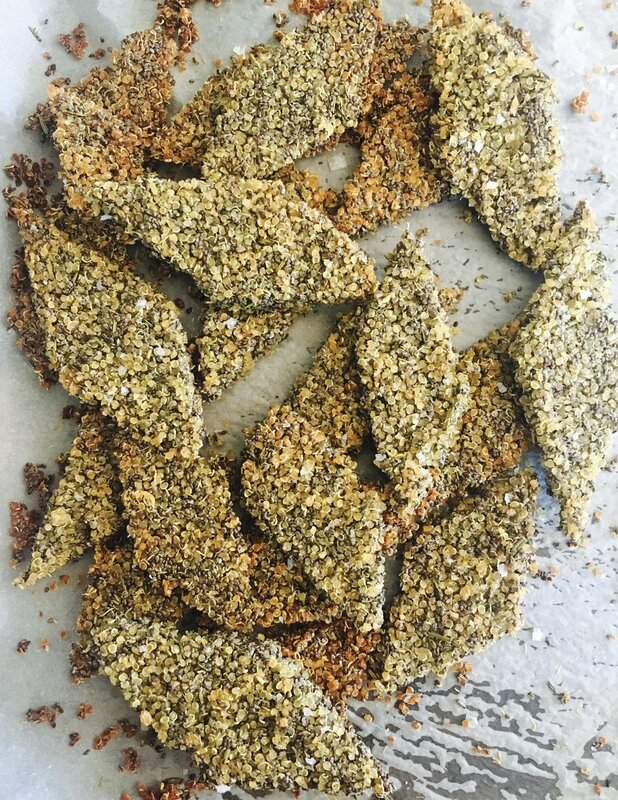 This month's Recipe Redux theme is "crunch snacks". 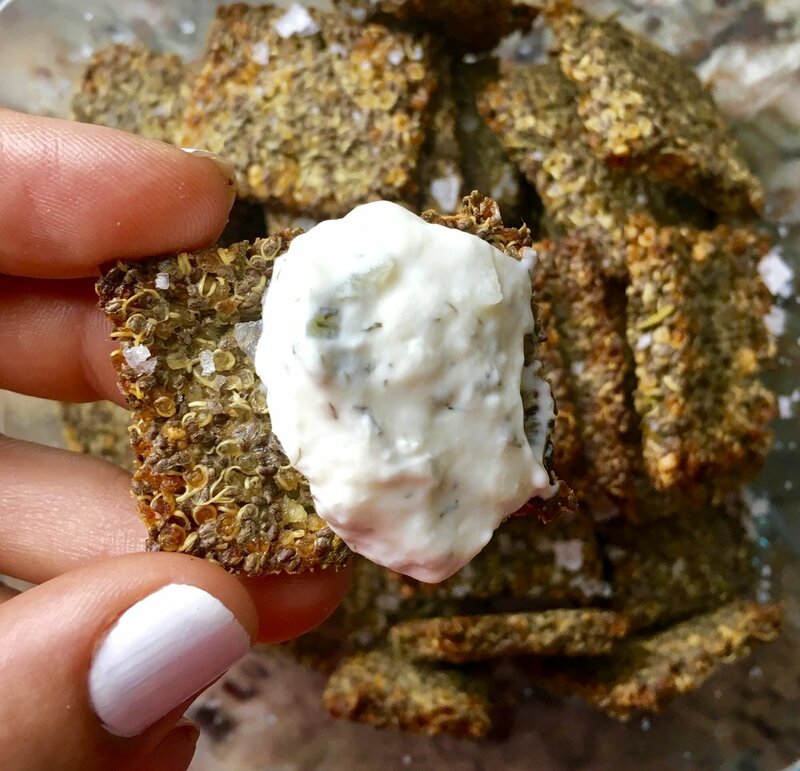 We all love a good crunch, but it's no fun when a cracker or chip falls apart in a bowl of dip or crumbles in your hand as you take a bite. This is one of those recipes that is so basic, literally anyone can make it. It's a great recipe to get the kiddos involved in! It only takes about 10 minutes of prep. Mix the ingredients, spread on a baking sheet, bake, cut and voila - the healthiest, whole food crostini you’ll ever come across. No ingredients you can't pronounce on this label! Neither my 14-month-old , nor my snacks-during-football loving husband could get enough of these! Granted, I don’t think they fully appreciated the pretty lox, tzatziki, rosemary presentation, but they used the rest of the crostini to just dip in the tzatziki on their own. Simple, and delicious! 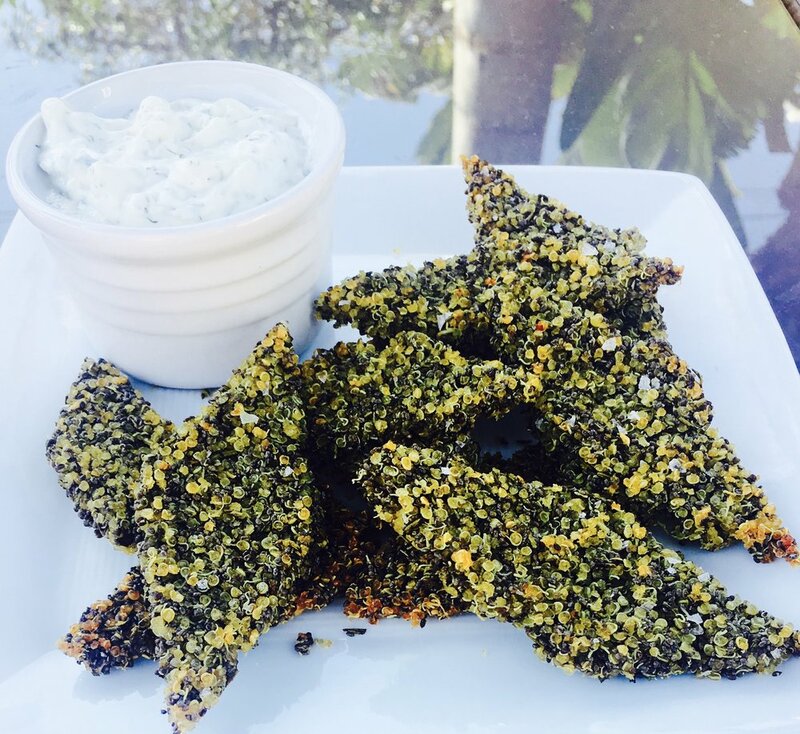 These crispy, textured snacks hold up really well to dip or can be topped individually for some beautiful appetizers. You can try cutting them in different shapes (shown below) depending on the look you're going for (lunch box basic, or dinner party fancy). Give it a try and let me know what you think! Combine all ingredients in a bowl. Mixture should be a bit sticky and clump together. If it seems to dry and is not holding together, try adding 1 Tbsp of water at a time until you reach desired consistency. Pour mixture onto baking sheet and spread out into even layer - about 1/8 inch thick. This should cover most of the baking sheet.The thinner you spread the mixture, the lower the cooking time and the more crispy the crackers will be. 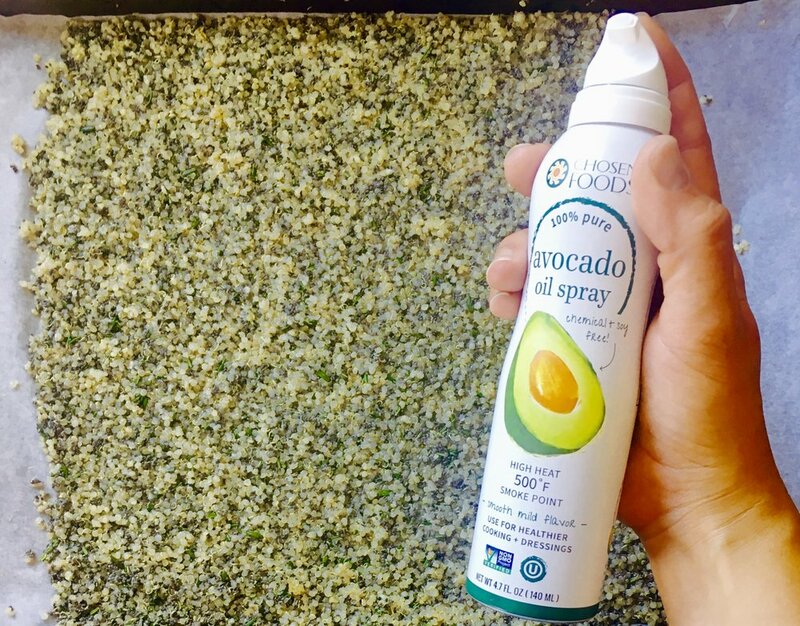 Spray top of mixture with avocado oil spray to help with browning. Bake in oven at 350F for 15 minutes. 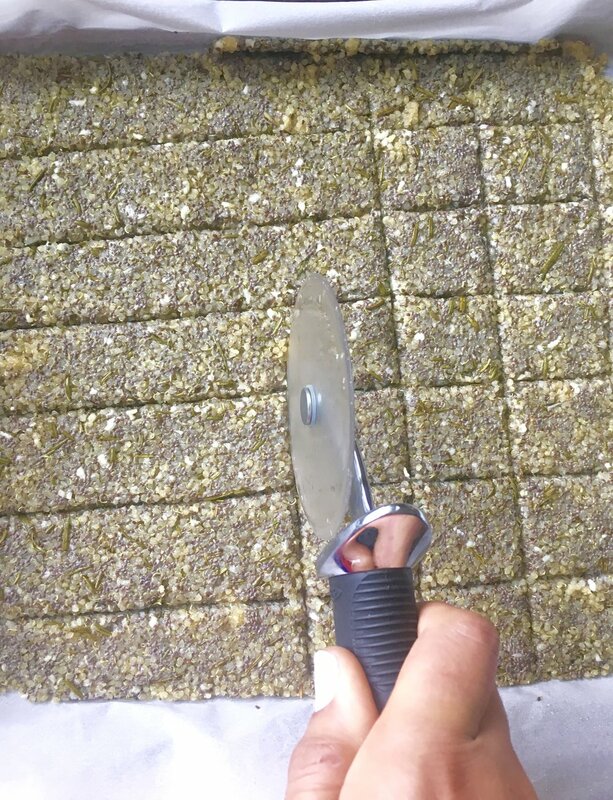 The crackers should be baked just enough to hold together for cutting. Remove from oven and cut crostini into desired shape. I tried both diamond shaped and plain old square. Both worked very well! Return to oven and bake an additional 20 minutes. If the crackers have not browned after 20 minutes, you can flip them upside down and bake an additional 10-15 minutes or until they reach your desired level of crispness.